Here’s another entry from Soulfood, the ever-creative, ever-exploring DJ Free and his apparently endless train of musical buddies. 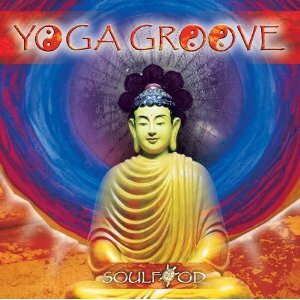 “Yoga Groove” is what I like to call “geezer rave.” It does have insistent percussion in parts, but these are much more laid-back and easy on the ears than true rave cuts. So as a self-professed geezer, I like it. Track 1 “Lotus” opens with a wood flute intro and some synthesizers, but swings into motion with upbeat percussions accompanying a languid flute melody. The album’s engineering ensures that the percussion never overwhelms the harmonies or lead instruments. Track 2 “Chakra Rhythm” it features a whack vocal track that alternates with chordal instrumental harmonies. Track 4 “Vinyasa” moves into action with pulsing percussions, tubular bells, and mesmerizing, wordless male and female vocal lines that feel like tribal ritual calls. The CD shifts gears on Track 6 “Mantra,” as swaying tribal drum rhythms act as a foundation for a piano lead. The final track “Bliss” is a light yet triumphant blend of flute, organ, sitar and piano (without percussion). This CD is pretty addictive because it’s rhythmic without making your ears bleed, and upbeat without being sappy. The musical content is original and predominantly Western in style, yet it draws on Eastern instrumentation and world drumming in a seamless, comfortable manner. Obviously the CD is targeted at use during yoga practice, but it’s a wonderful CD for rituals, socializing, and relaxation. Jump on the adult-contemporary, geezer-rave bandwagon and let this one spin on your stereo.